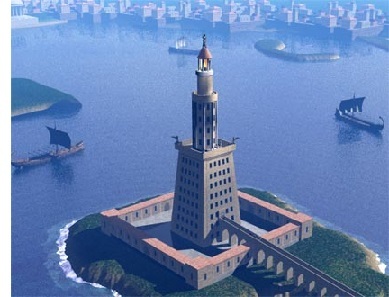 Lighthouse of Alexandria - Egypt was home of two of the Ancient Wonders of the World, one from the Dynastic Period and one from the Ptolemaic. The Great Pyramid at Giza (which still stands), and the Pharos (or Lighthouse) of Alexandria (which doesn't), respectively. The lighthouse was the final of the seven wonders to be built. Its construction began about 280 B.C., roughly the same time the Colossus of Rhodes was completed. And it was finished in approximately 247, which means that for only a very brief period, about 21 years, did all seven Ancient Wonders exist at the same time (the Colossus of Rhodes was destroyed by an earthquake in 226 B.C.). The lighthouse was built offshore on an island named Pharos (thus the alternate name, Pharos of Alexandria). Pharos was connected to the mainland by a causeway built by Alexander's soldiers at the time of the founding of the city. This had the benefit of creating two well-protected harbors on either side of the causeway. Because of its location and rapid growth, Alexandria became a very active port city. So a lighthouse was certainly a worthwhile investment. Though commissioned by the first Ptolemy (Soter), it was built entirely during the reign of his son, Ptolemy II Philadelphus. When it was finished, the lighthouse is believed to have stood about 400 ft (122m) high (no one knows for sure). If so, that would have made it almost four times as high as the Colossus of Rhodes and the second highest wonder after the Great Pyramid. One of the most intriguing aspects is exactly how the tower was lit. Some say it used a giant mirror to reflect the sun, some say a giant flame. Some say both, using a mirror in the day, and a flame by night when there was no sunlight. There are some issues with all of these. In ancient times, sailors almost never sailed at night because it was too dangerous. Unless blown off course, they would sail within sight of land and ground their ships for the night. This would eliminate the need to light the tower in the evening. However, they may have done so anyway, just to produce light. But then you have the problem of hauling the fuel up 400 ft to the top of the tower. It's possible the fire was lit at the base of the tower, and the same mirror used to reflect the sun also reflected the fire at night. I think it's most probable that the lighthouse was equipped with a giant mirror that reflected the sun. The issue with this scenario is that the sun was continuously moving across the sky, and so the mirror would have to be adjusted from time to time. Of course this wouldn't be a problem if the tower was constantly manned with guards. Like many things in the ancient world, a number of legends developed around the lighthouse. The most famous was that the beam produced by the mirror was so intense it could light ships on fire miles out to sea; certainly an impossibility. The Lighthouse of Alexandria was one of the longest surviving of the seven wonders, lasting until the Middle Ages. After a series of earthquakes damaged it beyond repair (it had not been maintained for centuries by then anyway), the Arabs used its stone to built a fort on the site in 1477. The Citadel of Qaitbay, which still stands today.